My name is Lisa Griffith and I am a certified Colon Hydro-therapist, Health counselor and Bio-feedback Technician. I trained under Dr. David Homer ND. CCT, at the Inner-Life Wellness Center, Belleville, Barbados. In the early 1990'S I assisted Dr. Homer as a Wellness Counselor and completed training at Cos-Medical Inc. in Los Angeles in Body Wrap and Weight-loss management before joining the Inner Life Wellness Centre as a Colon Therapist in 2004. 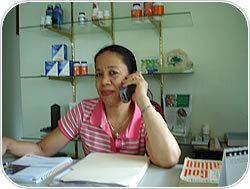 In 2005 I established GENESIS NATURAL HEALTH CLINIC. I have since expanded my education in health, through Prime Pacific Health Innovations in collaboration with the Boucher Institute of Naturopathic Medicine in Vancouver, BC, where I studied Colon Hydrotherapy, Chinese Visceral Manipulation and Lymphatic drainage massage. Over the last three years I have co-hosted several workshops with Dr. George Grant, founder of The Wellness Academy in Toronto, Canada, and have understudied him during his Biofeedback workshops. Recently I completed my training in Bio-feedback through Bio-Integrity INC. in Bonita Springs, FL as well as my training as a Certified Health Counselor through The Institute for Intergrated Nutrition, in New York City. I am also a member of the International Association for Colon Hydro-therapists, San Antonio, Texas (I-ACT), and a Board Certified Member of The Natural Therapy Board of the USA. I currently host GENESIS NATURAL HEALTH NEWS ON Q100.7FM.